Tradition meets modernity, simplicity and comfort with a touch of sophistication. We have a total of six new rooms (each about 25m²), which embody the lifestyle of the “Goldene Traube.” Natural wood, earthy colors and the finest materials will indulge your senses and enrich your holiday in the wine village of Tramin. 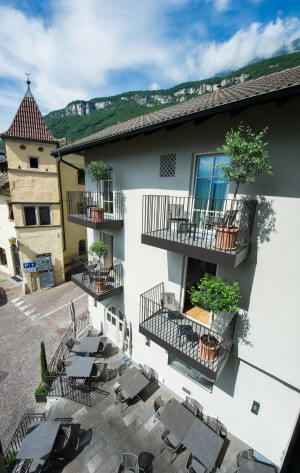 Each room has a balcony where you can enjoy the views, as well as extremely comfortable beds where you can sleep soundly. Since every room is equipped with air conditioning, you can enjoy Tramin even on the hottest days. Built with the finest materials, you can walk barefoot on the fine oak wood floor, whilst breathing in the fresh air of the morning full of sun rays – this is how it feels to wake up in the Vitis room. The soft greens of the vineyards create a fresh and colorful ambiance, together with the sumptuous effect of the robust oak wood, also used for the wine barrels, which is an integral part of the handcrafted furniture. The natural stone bathroom is equipped with a bath, shower, toilet and double sink. Arrive and marvel at the unique landscape on the South Tyrolean Wine Route. The rural-modern style paired with elegant and sophisticated accessories will inspire you. Genuine Swarovski stones sparkle in the headboard of the spacious double bed, as well as on the ceiling. Elegant crystal lamps shimmer magically, dancing with the soft shades of gray and the natural flooring and fine oak furniture. Like wine, which becomes a pleasurable experience thanks to its variety of different flavors, here in the Vinum Wine room you will also experience the harmony of different elements. Oak wood flooring, wooden furniture from the region and soft leather armchairs in natural colors form a harmonious and welcoming interior. The heart of the room is the round bed. Artistic lamps made of cork and glass bottles reflect the lively and passionate wine culture of our country. It is not the place where one has one’s residence that is home, but rather it is the place where one is understood. The Wine pass is included in the price. For those who like to stay in a central location, who like to treat their bodies well and who appreciate a warm and welcoming atmosphere, the "Goldene Traube" is the right choice. Take one step out of the door and you are standing in the village’s main square, the starting point for many walks and hiking trails and many other recreational activities. For those who prefer a quieter environment, our summer terraces offer a relaxing space and serene views of the country, perhaps accompanied by a glass of fine wine. Start your day in the best possible way, with our rich buffet breakfast of homemade juices, jams, yogurt and fresh fruit, meats, cheeses and desserts. In the morning we like our guests to eat (and feel) like emperors... and also at lunch and dinner if they so wish, in our restaurant (upon reservation). As a hotel guest you will receive 10% discount off warm specialties in our restaurant. We are here for you all year round. The best price is guaranteed here with us! Special weekly offers from €210/person/night including buffet breakfast (depending on the season). We will be happy to provide you with an individual offer! *Prices are per night and include a rich buffet breakfast. Staying true to the motto of our restaurant, we use carefully selected regional and seasonal products, with Tramin at the heart of every bite! **Single room. Double room for single use possible on request! Cancellation of the reservation: We will try our best to fill the rooms, so as not to charge you any expenses. Free cancellation is possible up to 30 days before the date of arrival. From 29 to 14 days before arrival a cancellation fee of €100 applies for each room booked. From 13 to 4 days before arrival a cancellation charge of 50% of the total amount applies. From 3 days before and in case of early departure 100% of the price of the total reservation will be charged. Cancellations are valid only if communicated in writing. European Travel Insurance: In case something happens before you travel, with our cancellation insurance you are financially covered. If you have to delay or cancel your holiday, cancellation fees may be charged according to EU law. In order to avoid any such charges, we recommend that you take out our cancellation insurance.